To install Dynatrace OneAgent, if you are a SaaS customer, go to Dynatrace.com and Login using the username and password you received from Dynatrace in your signup confirmation email. If you are a Managed customer, access the Cluster Management Console and choose the environment you want to monitor. Then continue with the installation steps provided below. You need administrator rights for the servers where Dynatrace OneAgent will be installed as well as for changing firewall settings (necessary only if your internal routing policy may prevent Dynatrace software from reaching the Internet). You need permissions and credentials for restarting all your application services. You need to check also the disk space requirements. All hosts that are to be monitored need to be able to send data to the Dynatrace cluster. Depending on whether your Dynatrace deployment is on SaaS, or on Managed environment, and on your network layout and security settings, you may choose to either provide a direct access to Dynatrace cluster, or to set up an ActiveGate. OneAgent Windows installer doesn&apos;t support the modify and repair operations. You can&apos;t reinstall OneAgent using the same installer version as the installed OneAgent. To reinstall OneAgent, uninstall it first or simply install a newer version. Click the Start installation button and select Windows. Click the Download agent.exe button to download Windows installer (EXE file) for single-server installation. Click the Download MSI package link to download the Windows installer for Group Policy deployments. You get a ZIP package that includes an MSI file and a batch file with the command line you can copy and paste when configuring Group Policy for Dynatrace installation. The default installation should work in most cases, but if you need to customize it, modify only the parameters described below. Then, you have to create a distribution point, assign a package (the OneAgent MSI installer with parameters) and publish your policy. Run the executable file and follow the displayed instructions. If your environment is segmented, for example into development and production, consider organizing your hosts into host groups. To do this, select the Set host group for this host option and provide a name. If the name you enter exists already, the host will be added to the group with this name. If you provide a new name, a new host group will be created. Restart all processes that you want to monitor. You’ll be prompted with a list of the processes that need to be restarted. Note that you can restart your processes at any time, even during your organization’s next planned maintenance period. Though until all processes have been restarted, you’ll only see a limited set of metrics, for example CPU or memory consumption. Dynatrace OneAgent is a set of specialized services that have been configured specifically for your monitoring environment. The role of these services is to monitor various aspects of your hosts, including hardware, operating system, and application processes. Installs executable code and libraries that are used by Dynatrace OneAgent. Creates entries in the Windows Registry that start Dynatrace OneAgent as a SYSTEM service. Additionally, the oneagentmon device and WinPcap are installed to allow better integration with the operating system and to facilitate the capture of network statistics. Checks the system’s global proxy settings. Checks for a connection to Dynatrace Server or ActiveGate (if you installed ActiveGate and downloaded the OneAgent installer after ActiveGate was connected to Dynatrace). Access computer from the network. Log in as a batch job. Log in through Remote Desktop Services. The dtuser is required for Dynatrace to operate properly, therefore you must not delete it. If, for some reason, the dtuser was deleted, next update will recreate it. For a summarized view of the changes made in your system&apos;s files by OneAgent installation, please visit Changes on Windows files page. It’s recommended that you install the version of WinPcap that is packaged with the Dynatrace OneAgent installer. Its library is the cornerstone of Dynatrace network analysis. We’ve packaged the library in such a way that its DLLs are seamlessly integrated with Dynatrace software, thereby enabling unattended updates and other advantages. If you already have WinPcap installed, please remove it before Dynatrace OneAgent installation. The installer includes the latest, unmodified version of the library—so any other software you have that relies on WinPcap won’t suffer from library loss. Great, setup is complete! You can now take a look around your new monitoring environment. 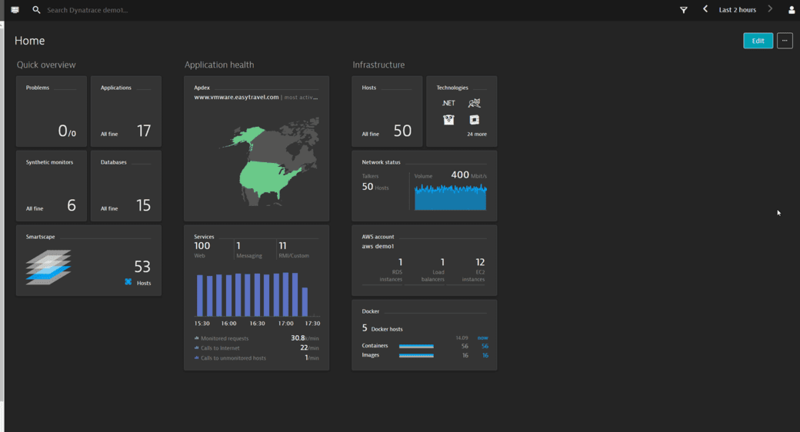 If you are a SaaS customer, you can access your monitoring environment anytime by going to Dynatrace website and clicking the Login button in the upper-right corner. If you are a Managed customer, you can access your monitoring environment through the Cluster Management Console. One last thing: to monitor your processes, you need to restart them. At any time, you can check which processes aren&apos;t monitored and need to be restarted. Just select Deployment status from the navigation menu, click the All hosts or Recently connected hosts tab, and expand the host you are interested in.